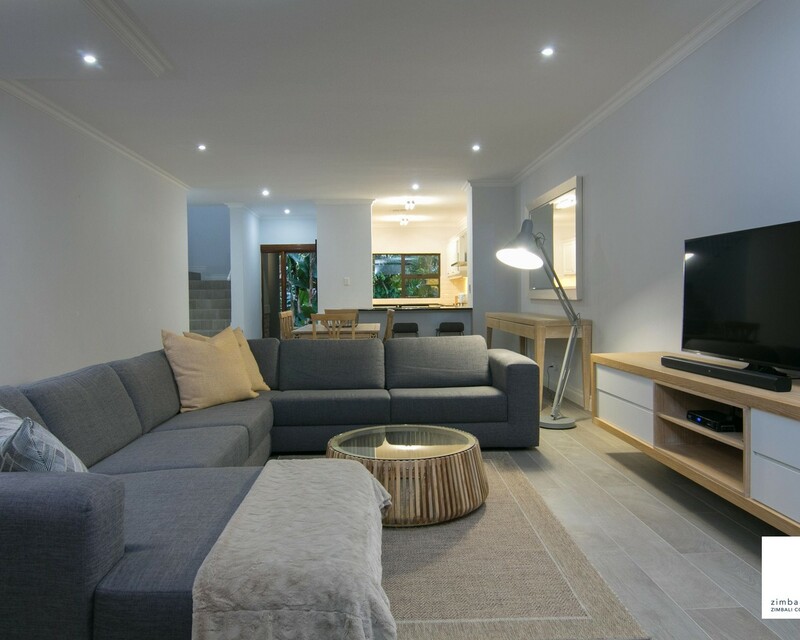 This spacious three bedroom Zimbali Chalet has just been completely redone with modern finishes. The open plan kitchen serves the dining and lounge areas, which lead out to an under-cover patio with a bar. Perfect for relaxing, braaiing and enjoying the forest views and birdlife. Upstairs is the large main bedroom with en suite bathroom and balcony. Downstairs are the other two bedrooms (both en suite). This house is perfect for six people. Guests have access to the complex swimming pool. The Chalet is located close to the Valley of the Pools and Zimbali beach. It also enables guests to use the Bushbuck clubhouse and pools, 18 hole mini-golf, and book at the golf course, restaurants and Spa's within Zimbali. No Smoking Allowed. Toilet paper, dishwashing soap and black bags provided on arrival. Golf Cart not included.